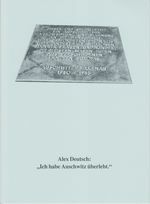 DVD "Alex Deutsch. I survived Auschwitz." 'Do not get into drifting in hatred and violence against other people. Learn to live together, not against each other ', this is the motto of Alex Deutsch witnesses. The documentary follows the survivors of Auschwitz to the most important stations of his past and present, from Berlin to Auschwitz and St. Louis to Wiebelskirchen. 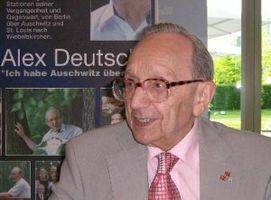 Alex Deutsch: "I survived Auschwitz." Each other, not against each other! 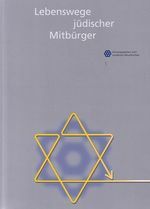 A migration book, which is dedicated to Alex Deutsch.The book has received the Edith Aron Price of Homburg and offers something for every reader a treasure trove of topics related to "Migration and Integration" - consistent with references to Alex Deutsch. Saarpfalz-Gymnasium and the publisher Eberhard Jung. Alex Deutsch - "I survived Auschwitz." The exhibition documents the most important life stages of witnesses, from Berlin to Auschwitz, St. Louis until after Wiebelskirchen. The exhibition includes eight panels: panel title, Childhood and Youth, baker's apprentice and marriage, arrest and deportation, selection and deprivation, starvation, and forced labor, new start and racism, return and dialogue. A timeline allows each station to a historical period in history. The exhibition aims to contribute to the history of the Auschwitz survivors are not forgotten. Thus, this begins with Alex Deutsch's life motto:. "Do not get into drifting in hatred and violence against other people lives with each other, not against each other."